I made this sculpt with 3.5 R2, but most of the workflow is still relevant. I begin with a very basic base mesh, then begin exploring different ideas by cutting in big slices with the planar path cut and planar flatten brushes. At this stage I also build up forms with clay tubes, then smooth them out with the classic flatten, smooth, and planar path brushes. When using the planar path brush, I often use a brush much larger than the area I need to affect, and protect surrounding areas with masks. I was able to push this sculpt to a decent level of detail without retopologizing, but in the future I will make use of the groupsloops function to add resolution on the fly. Quick Sketch is one of my favorite ZBrush features. Being able to sketch with symmetry makes it so fast and easy to explore new designs. The pen brushes make it very easy to achieve some really cool effects, and lazy mouse makes the lines nice and smooth. The ability to use the smooth and move brushes for 2D painting is very powerful. The smooth brush can be used at varying sub-d levels to quickly blend tones, and the move tool is great for tweaking proportions. 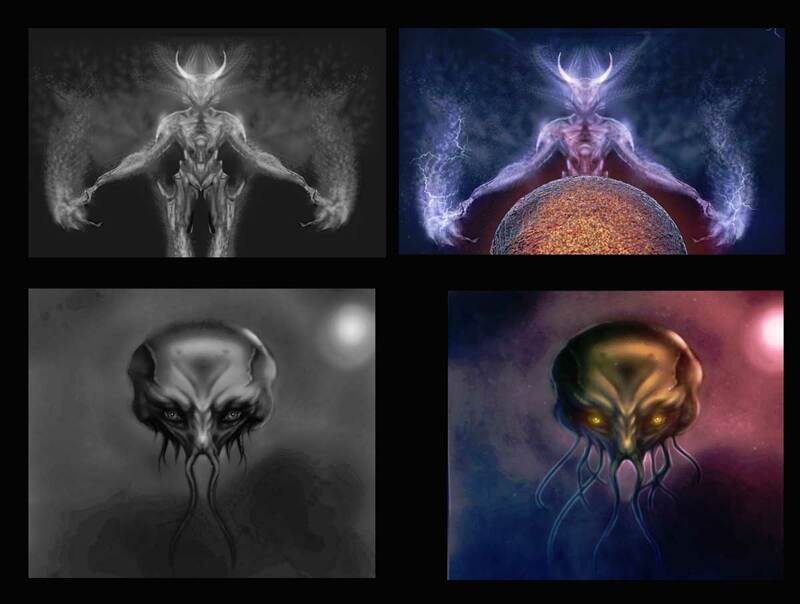 I bring the black and white poly-paintings into Photoshop for additional coloring and effects. In one of the images, I incorporated a 3D magma- sphere that was created by compositing several mat-caps together. The new outline thin mat-cap created a great rim-light effect, and by creating a cavity mask and hiding the unmasked areas, I was able to quickly create a layer for the glowing magma.